I heard about Whiplash all the way back in January, when I was up in Park City, Utah for the Sundance Film Festival. The film was the talk of the town ever since the film opened the festival. After the festival ended, the film won the Grand Jury Prize and the Audience Award. Some of the most revered and admired independent films of the past 30 years have won those very awards, and I’ve heard nothing but praise since then for Whiplash. The movie is opening in the prime of awards season, with many touting the film, the direction and screenplay by Damian Chazelle, and the performances by Miles Teller and J.K. Simmons as serious awards contenders. While I wasn’t crazy about Teller’s breakout role in last year’s The Spectacular Now, I did admire the young actor as one that could very well be one of the best of his generation. Hollywood has already cast him in the Divergent series, and next summer he’ll be playing Mr. Fantastic in Fox’s Fantastic Four reboot. Sounds good so far. 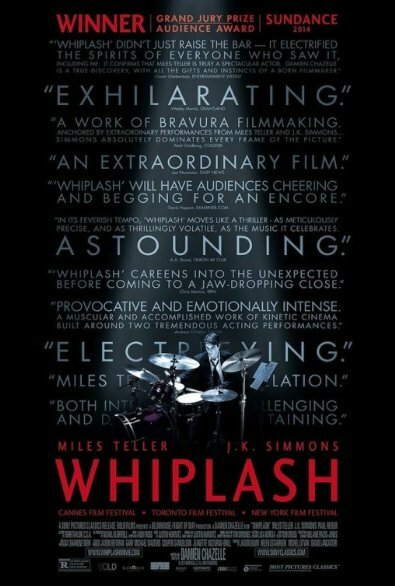 Here’s my review of Whiplash. Teller plays Andrew, a freshman at the prestigious (but fictitious) Shaffer Conservatory in New York City, which is considered to be the finest music school in the country. Andrew is a drummer, and he looks up to the great jazz drummers like Buddy Rich. One day, while practicing a very complex piece of jazz percussion on his own, he catches the eye and ear of Terrence Fletcher, a legendary teacher and composer at the school, played by Simmons in the film. Andrew joins Fletcher’s esteemed group, but he later finds out how tough the ensemble is, which Andrew accepts at first since the school is the finest in the country. But Fletcher, as we find out, is a brutal and evil man, who pushes everyone to their breaking point, all to play some jazz. The film chronicles a full school year, with Andrew and Fletcher’s relationship being the main focus of the film, and how Andrew’s drive for perfection affects everyone around him. This is Chazelle’s second feature film, with his last feature being the little seen Guy and Madeline on a Park Bench. Whiplash is actually an adaptation of the short film of the same name, which Chazelle directed. Simmons also played the same character in the short film that he plays here. I’ve always been a fan of J.K. Simmons, and I’ve always admired director Jason Reitman (whose an executive producer on the film) for putting the veteran character actor in supporting roles in all of his feature films. Simmons is a great actor whose never really had that breakout performance to make him a household name. That mindset changed once I saw Whiplash this afternoon. The man has never been better in this role as this psychotic, perfectionist of a teacher that words like evil and bad can’t really describe him. And for nearly the entire film, you can’t stand the man. You can’t get over the fact that he’s getting away with verbally assaulting these college kids. He’s a perfectionist, as most musicians are. Some of my best friends are musicians, and I can understand that mindset. In a way, Andrew in the film is Yin to Fletcher’s Yang. Andrew doesn’t come from a family of musicians, and was raised by his father, played by Paul Reiser, since his mother left when he was younger. Both Andrew and Fletcher are portrayed are intense and dedicated to their craft. When both of the actors are on screen together, and the mood begins to get tenser and tenser, it’s nothing short of brilliant. It’s electrifying to watch the rehearsals with the two, as at one moment, Fletcher warms up to Andrew, and then in a split second, the feeling goes cold. Luckily, Simmons has a very good chance at getting a lot of awards recognition this year for his performance, and at this point, I don’t see anybody else being as good as Simmons is in the supporting actor categories. Simmons plays the character of Fletcher as unexpected, darkly funny, darkly perverse and a portrayal of something that probably goes on at music school (this is why I don’t plan on going to music school anytime soon, if ever). Teller is fantastic here as well, with his role and this film he’s in being miles (no pun intended) ahead of the work he did in The Spectacular Now. His role in this film is a much quieter, and less annoying than the certain moments in that film. Andrew is an introvert, who doesn’t really have any friends. The only relationships he has are with his father and a girl who works at a local movie theater, played by Melissa Benoist. He even cuts off ties with the girl so he can continue to perfect his craft in the world of music. It’s quite fascinating to see the transformation take place, and see how the world of jazz works out and is like. And of course, the music is spectacular throughout the film, with all sorts of pieces of jazz being played throughout the film, either in sequences of practice or concerts, or the score of the film. All of this adds up to make Whiplash one of the most memorizing and entertaining films of 2014. I fell in love with this film from the first frame to the final one. Speaking of which, the final sequence of the film, is perfect. I have no complaints with it, and it’s one of the best directed and edited sequences I’ve ever seen in a film that’s already beautifully directed and edited. Miles Teller will continue to become one of the finest actors of his generation, and at this point, J.K. Simmons goes home with an Academy Award for his brilliant work in this film. If Whiplash is showing in your area (I think the film expanded nationwide this weekend) I highly recommend you going to see this fine film. I can’t say it’s as great as that other film I saw at Sundance, but Whiplash is one of the very best films of 2014, and of the decade so far. I really look forward to the next time I get to see this brilliant independent gem. November 16, 2014 in 2014 Film Reviews, Movie Reviews.